Italy 2011 Report: Valdidentro to Bernina v.v. This Foscagno is not very demanding, but it still has some steep(er) stretches and it’s long. However, compared to some of the ‘hard hitters’ he climbed so far, it’s relatively easy. Once on the summit, he was expecting a long descent into Livigno, but there was a surprise climb to the summit of the Eira pass after some 5 km. This climb was only around 3 km long and not too difficult – after that the real descent to Livigno continued. Once in Livigno (Sant’Antonio), he turned left and started the climb to the Forcola di Livigno. The first 5 km or so where practically flat, but the head wind was quite strong – the valley actually functions like some kind of funnel for the falling winds from the high mountains. Since the Forcola hardly has any turns to speak of, the wind was spoiling the fun most of the way up to the summit. The climb to the Bernina summit was actually only the last 4.5-5 km of the real thing (profile -‘Bivio Livigno’ at 2,020 m), but it was worth his trouble. The views on the top are great and they had a good lunch on a sunny (shielded) terrace there. After that he started going back the same way he came, so the Forcola was attacked from the other side, as well as the Eira and Foscagno. A 100 km trip in total, with 2,866 altimeters – perhaps not the easy start he originally had in mind, but he can’t help himself. 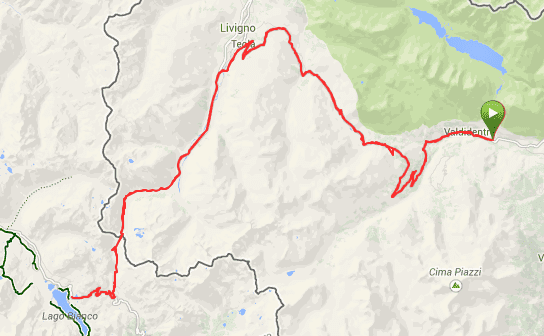 Tomorrow, the Gavia from both sides, perhaps combined with the Tonale pass. Report on 2015’s climb along the full length of the Bernina here.